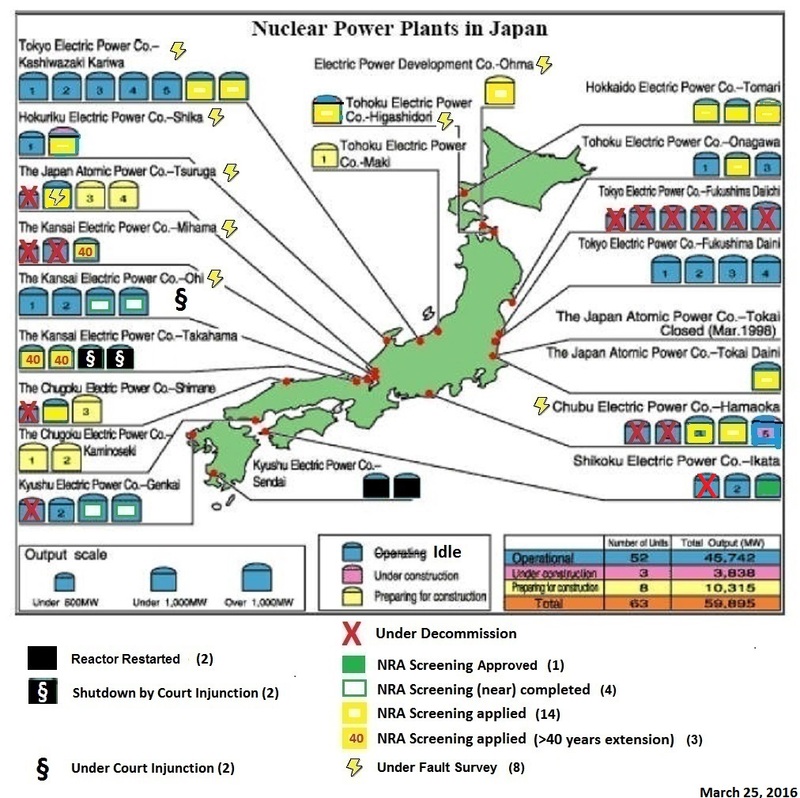 The fukuleaks.org/web research team has been busy looking into the newly claimed safety efforts at the Oi nuclear plant in Japan. The Prime Minister and Fukui governor have given their approval to restart units 3 & 4 at Oi, ending Japan’s days of being nuclear free. Though Japan has been largely nuclear free for months as most reactors have been offline for an extended period of time. The reactors at Oi have been offline between 6 months to 1 year. KEPCO is now trying to rush the restart of unit 3 to a short few weeks. The longer a reactor is offline the more work is involved in restarting it. Oi has a number of known issues and past safety problems that have not been resolved. The plant’s siting and design create a number of inherent risks. 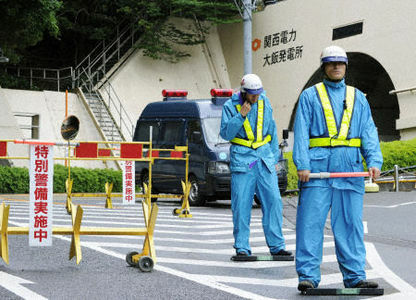 The safety upgrades are all illusion intended to give the public a false sense of safety while the powers that be in Japan go right back to business as usual gambling with the lives and livelihoods of everyone. The reactors at Oi are Westinghouse PWR reactors. 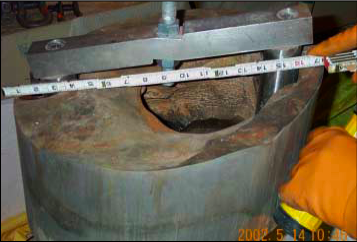 30 of this type of reactor worldwide have been found to have reactor head corrosion and cracking issues. This is happening where the control rod drive mechanisms connect to the reactor head (cap). Borated water is used in these reactors and this has caused issues of corrosion in reactor caps. The most famous being the Davis Besse reactor where a pineapple sized hole was eroded out of the reactor cap. Davis Besse is a different design of PWR but was still subject to the cap problem. The Westinghouse PWR design has a well known problem with reactor head corrosion. 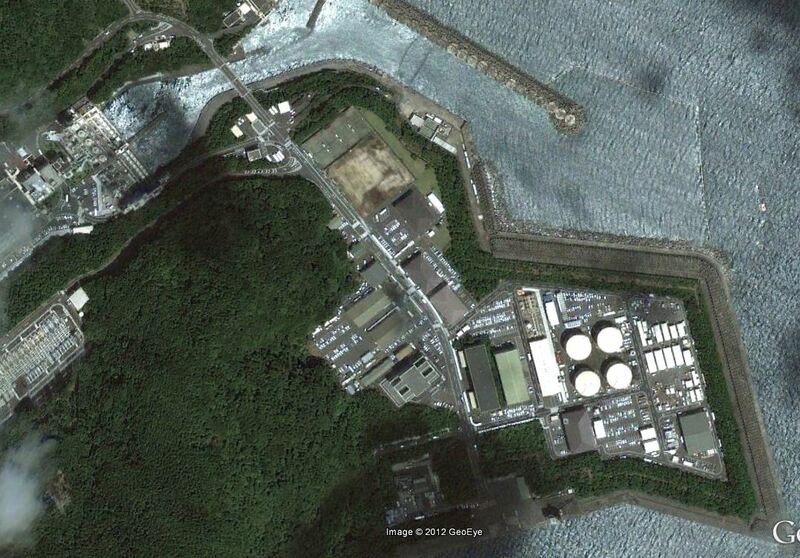 Kansai Electric replaced the reactor caps at units 1 & 2 at Oi but did nothing to units 3 & 4. Units 3 & 4 were built a little over 10 years later than units 1 & 2. The caps at units 3 & 4 were not replaced even though cracks and leaking were found in the cap at unit 3. Kansai’s solution was to lower the vessel head temperature during operation to try to slow the degradation. 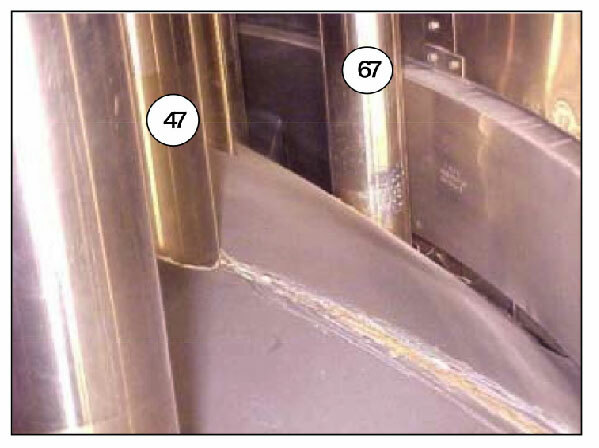 Unit 3 has cracks and leaking boron solution (what caused the huge hole at Davis Besse) at multiple control rod connections as seen in the photo below. This was found in 2004 so it is unclear how degraded or cracked the cap may be now. This known failure issue could easily cause a catastrophic problem at Oi units 3 or 4.
cracks and leaking boron at Oi unit 3 in 2004. Pineapple sized hole in the Davis Besse reactor head. The damaged area and hole were cut out of the cap for further inspection as seen in this 2002 photo. CNIC also revealed that unit 3 at Oi could be at risk for significant damage in the case of a plane strike. The estimate used a fully fueled 747. 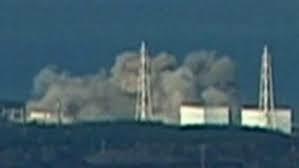 Plane strike damage has not been included in any stress tests of reactors in Japan. Oi’s narrow “U” shaped low terrain does not have an outlet. 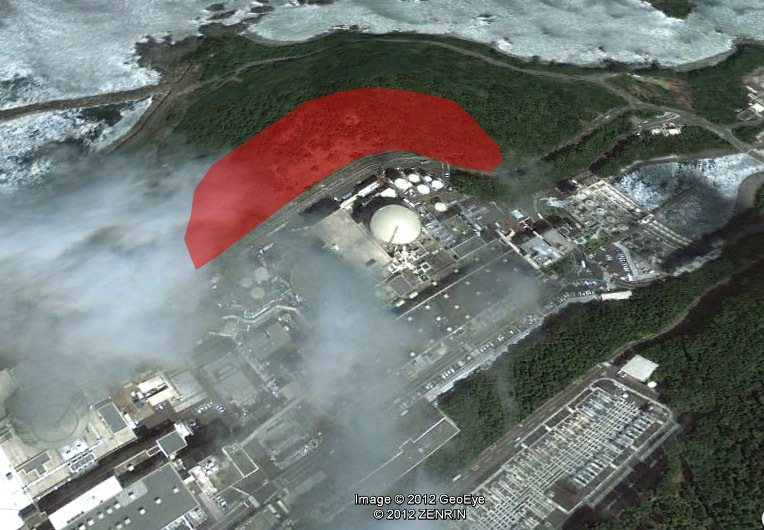 How the intensified tsunami would act upon the surrounding hillsides and the end of the “U” where the one road into the plant is raises multiple concerns. 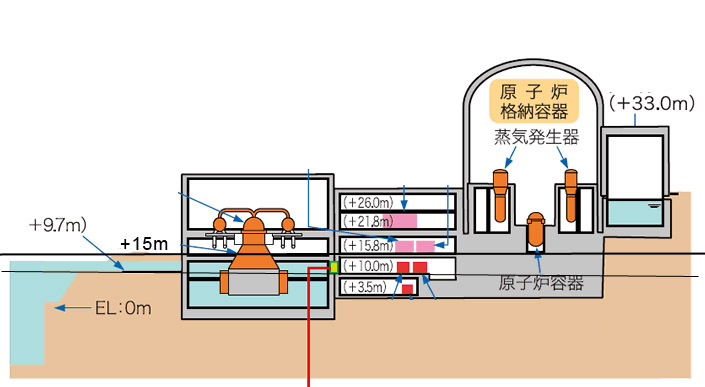 If the terrain can intensify both the damage and height of a tsunami, current assumptions that equipment over 15m above sea level would be safe may not be conservative enough. Oi nuclear plant during initial construction. This shows the narrow, deep inlet created for the plant. Many of the support facilities for Oi sit in the area pictured to the lower left. This is near sea elevation and at the seafront. This map of the sea floor shows the terrain offshore of the Oi nuclear plant indicated with the red dot. 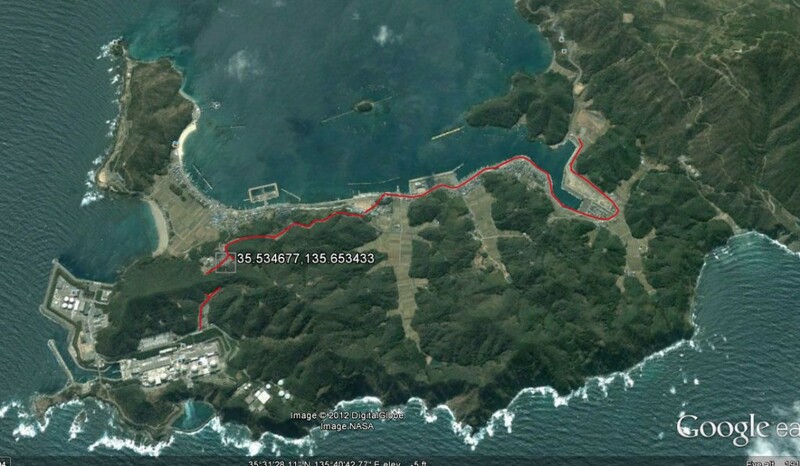 Shallow water and coastal land act to compress the water of a tsunami increasing the destructive power and height. The sea floor funnels into the large bay and a fairly steep incline in the sea floor happens where the peninsula Oi sits out past the main peninsula. 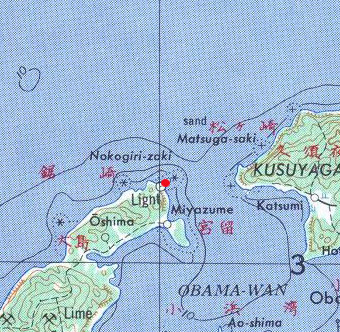 Oi is identified by the red dot that covers the actual peninsula. This does show some potential for a tsunami to be increased in the general area of the plant. NISA has discovered that the north hill near units 1 & 2 at Oi is at risk for a landslide. The entire plant is surrounded on 3 sides by steep hillsides. While most have terracing and retaining wall systems, such things are not 100% resistant to quake or tsunami damage. Oi also has one road into the plant. One road follows the larger peninsula, hugging a low shoreline. This road then turns towards Oi, then splits with each going into a long tunnel through the mountainside and then joining up on the other side. There is then an extended section of one road that goes to the plant itself. The low road along the bay, the tunnels and the single section of road to the plant are all considerable risks that the plant could be cut off from all access. This is at great risk for major tsunami damage, landslide blockage, earthquake damage or tunnel collapse. The small upper complex with a series of tanks is only accessible by a tunnel from inside the complex that goes up to that location. We saw after the 3-11 earthquake that many roads were destroyed as the movement tore apart roads Winter ice storms, snow, even a vehicle accident could also sever the one way into or out of the plant. KEPCO cites that they have looked into options to try to bring in supplies by sea or helicopter if the road was blocked but have none of their own equipment. They know there is a high risk of being totally cut off. The general landslide risk inside the plant complex also raises concerns about damage or blockage of key areas, loss of offsite power and also the safety of any equipment staged at a higher location. The plant itself has very limited land space. The complex sits in a narrow valley built to accommodate the plant. There is no room on the peninsula for equipment to be brought in and placed or to put storage tanks. 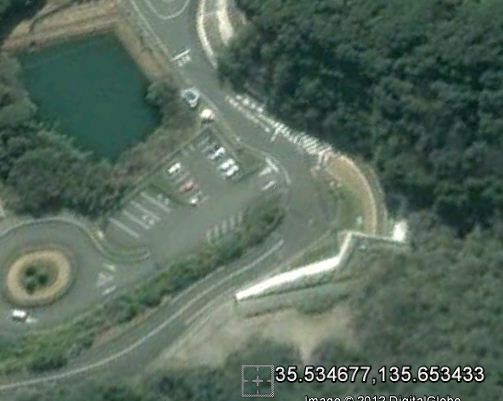 A very narrow 2 lane road rings the reactors with a very small amount of available flat open space to place anything. Most of that sits at the lowest elevation beside the turbine buildings in a direct line of the intakes creating a very narrow low area that would likely collect tsunami debris. At Fukushima Daiichi hundreds of tanks have been placed to hold untreated and treated water that has leaked or been used to cool the reactors. Wide expanses of open land have been used up near Daiichi to house all the facilities and storage needed to cope with the accident. Oi does not have any ability to house such a system. During the worst at Daiichi fire fighters and workers struggled to run fire hoses from the sea up to the reactor buildings by hand through the tsunami rubble by hand. Carrying heavy hoses and placing them manually while wearing respirators and radiation suits proved far more difficult that assumed. Some of the existing facilities at Oi sit away from the plant up on a hill top. This type of equipment such as tanks are likely connected to the site by underground pipes and cables that are at high risk for being damaged in a quake or landslide. These tanks could also leak causing fuel to spill into drainage systems or otherwise run downhill causing more risk down near the reactors. red line shows the road into Oi, with tunnels and low path along the shoreline. 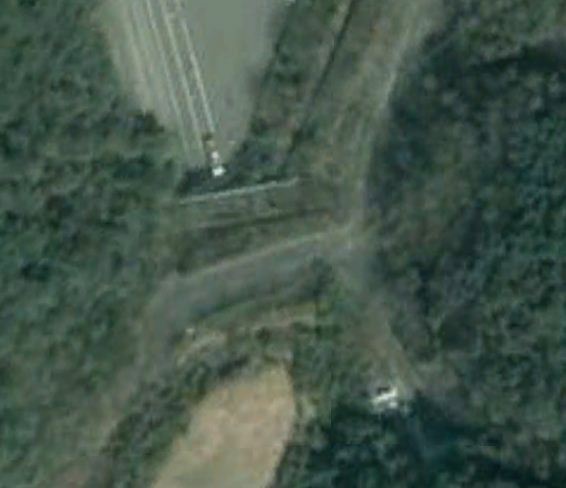 tunnel #1 entrance to Oi nuclear plant via Google Earth. Area of tunnel exits via Google Maps. Areas at Oi that are flat and somewhat open. Most of this is 2 lane road. The areas to the right are at the lowest elevation and at high risk for clogging with tsunami debris. The intake canal shows a bottle neck as water comes into the plant. 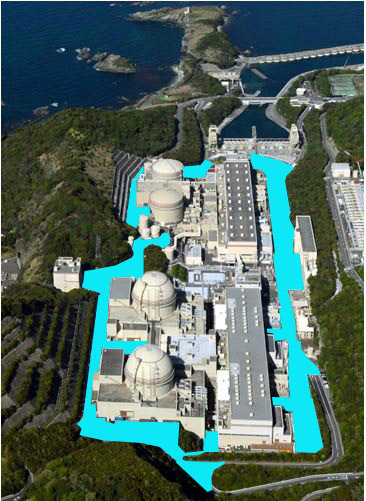 In a tsunami, debris could block this narrow area causing more issues with providing cooling water to the reactors. This overhead image shows the narrow portion of the intake canal and also a tank farm that sits low on the sea front. Active fault lines run under Oi according to two university researchers cited by the Yomiuri. EX-SKF has a translation. NISA has dismissed the active fault lines out of hand and has refused to investigate the issue further or modify anything related to the Oi nuclear plant. Plant height risks exist at Oi. While there are high hills all around the plant, the main portion of the plant sits between 9.7 and 15 meters above sea level with many key pieces of equipment below that level. The equipment in pink and red in the diagram below are key components such as important pumps, electrical panels, diesel generators and the control rooms. With the known tsunami factors where an incoming tsunami could be intensified and increased in height due to the shape of the plant complex facing the sea it is easy to see the potential risks at Oi for many key systems. At Fukushima much of the problems came due to electrical panels and generators being swamped and damaged by water from the tsunami. Below the 15m water line sits two sets of feed water pumps and the emergency diesel generator. This translation shows some of the equipment below the obvious flood level at Oi. Oi was the model containment structure used in a test at Sandia National Lab in the US. The test was done by OECD members and Sandia. The member countries of OECD were involved to perform and report on their own analysis. They built a 1:4 model of the containment at unit 3, Oi. They found that 1.3 MPa (188.5 psi) at a rate of 5psi/min caused cracks in the containment structure and breaks in the rebar over time. “Wetting” was seen as the pressure was increased indicating cracks forming, this would also result in the release of fission products to the environment. 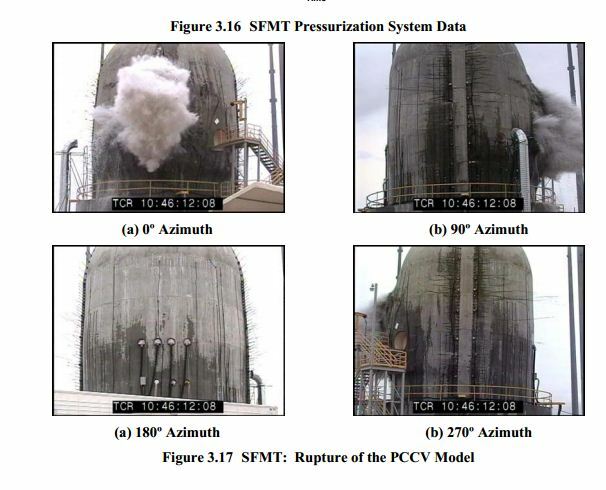 An additional test created a total failure of the containment structure at 206.4 psig. The testing didn’t show a specific deficiency but did establish the point beyond the designed maximum pressure where containment would fail. Acoustic detecting systems could be beneficial to detect early failure of tendon wires which could result in emissions. Oi unit 3 containment catastrophic failure at 200 psig. Resulting damage to the Oi unit 3 containment model. The Japanese government ordered “stress tests” of the nuclear plants to confirm their safety. This was only done via computer simulation and the actual simulations or any details of them is not being released to the public. What is admitted about the stress tests and the very limited scope that appear they were largely done in a manner to obtain a desired outcome. Only the direct impact of an earthquake or tsunami on the reactor cores was run in the simulations. These simulations ignore the need for “defense in depth” and the many other factors or incidents that could challenge safety at the plant. There has been considerable criticism of these stress tests by many experts in Japan. The phase 1 stress tests were conducted by the power company and Mitsubishi, the builder of the plant. They were not conducted by an impartial 3rd party. 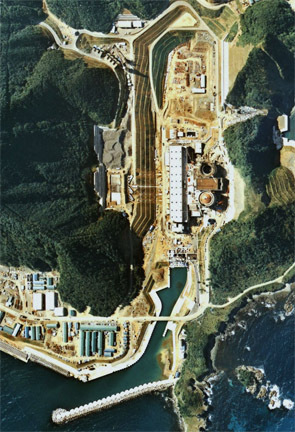 Only phase 1 of the nuclear stress tests has been completed for any of the plants in Japan. The stress tests have been soundly slammed by experts. They state that the stress tests were merely rubber stamped for approval by the IAEA. This appears to be the case based on the mandate of the office giving the approval at the IAEA. The experts cited mention this about the phase 1 stress tests. 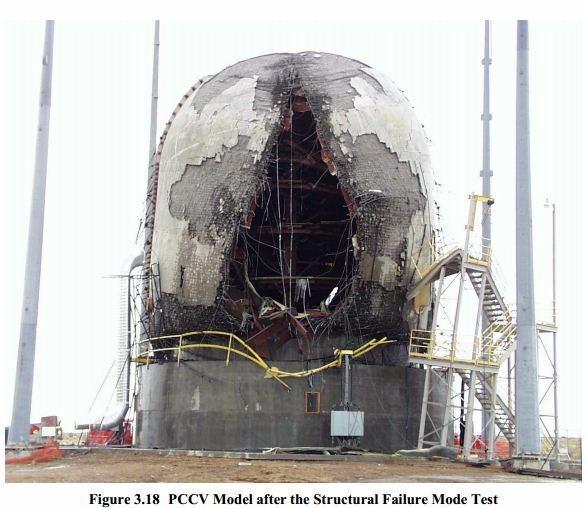 The phase 1 stress tests do not prove any safety of the plant and may actually do the opposite by giving a false sense of security as the actual tests do not prove any tangible safety. Phase 2 stress tests have not been done. Phase 2 covers accident prevention and mitigation options, radioactivity discharge, evacuation, etc. These are all critical exercises that could show the true challenges at Oi, even as an optimistic computer simulation. The reality is that this critical issue has not even been explored before approving reactors for restart. Something else uncovered in the push to restart the reactors at Oi is that the mayor of Oi owns a nuclear power plant maintenance company. He started the company with his son after he became mayor and went from nothing to making millions of dollars in a brief time through this business. He clearly has a conflict of interest regarding the restart of the Oi nuclear plant. The city of Oi also receives about $32 million USD in nuclear subsidy money from the Oi nuclear plant each year. 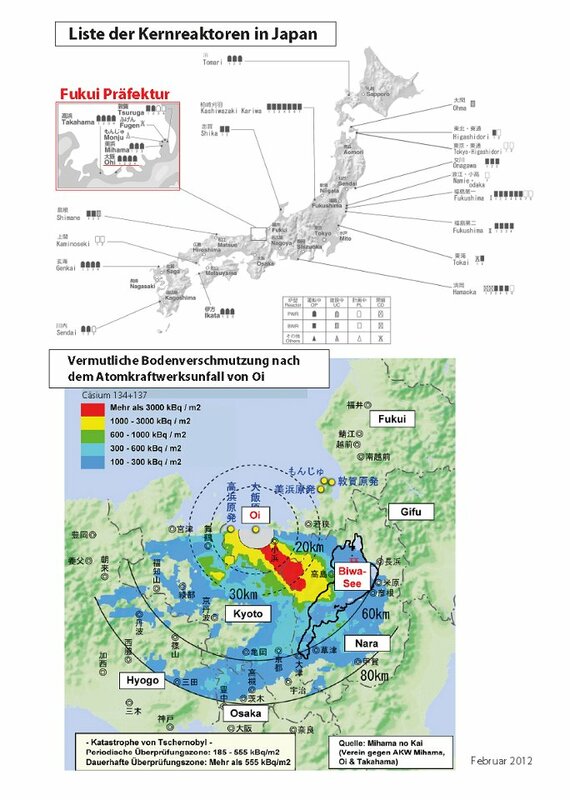 Atom Free Japan has provided a plume simulation map to give an idea what an accident at Oi could do to the larger area. It shows that Lake Biwa, the largest fresh water source in Japan would likely be contaminated by a disaster at Oi. The Fukui government issued a nuclear safety report. This looked at a number of risk areas at Oi and attempted to come up with some solutions to improve safety at the plant. The committee working on the plan documented some items that would be done before a restart and others with estimated years of completion. None of these items are legally binding in any way that we could determine. Meaning KEPCO could delay them further or put them off without being forced to shut down the plant. The actual safety measures show a clear pattern. Things to be done before the plant restarts are largely on paper or items that do not require considerable money or actual physical changes to the plant. The pre-restart items are simply fluff intended to look like they have done something. They also do nothing to actually PREVENT an accident, with the exception of some reinforcement work of the incoming power line towers. Everything else in the pre restart work is hoping to better deal with an accident after it happens. Much of the safety work involved evaluations or other on paper exercises that do nothing to actually change the conditions at the plant. Many of the actions didn’t involve actually obtaining needed equipment but to merely find a vendor that sells such equipment in case they would need to buy it. This is the list of items cited by the Fukui Nuclear Safety agency. Oi has a number of considerable problems in both the inherent issues of the site and the current plant safety systems. Emergency generators currently sit below the assumed flood line. AC power is required in order to operate the cooling systems available with these reactors. With the generators and some of the power equipment & pumps below the flood level, safety is very much at risk. KEPCO did reinforce the power line towers but they have done nothing to upgrade the safety of the switch yard. All of the meaningful safety upgrades for the plant are pushed to the future without anything binding forcing KEPCO to actually do the work. One of the most critical features is the seismic isolation building. This is one of the few things that went right at Fukushima Daiichi. It has been the lifeline that has allowed the workers to stay at the plant. Without it they would have likely had to abandon the plant during the worst of the disaster. Oi currently does not have one. If KEPCO manages to eventually do all of these safety upgrades it does not take away from the inherent risk of the plant design. 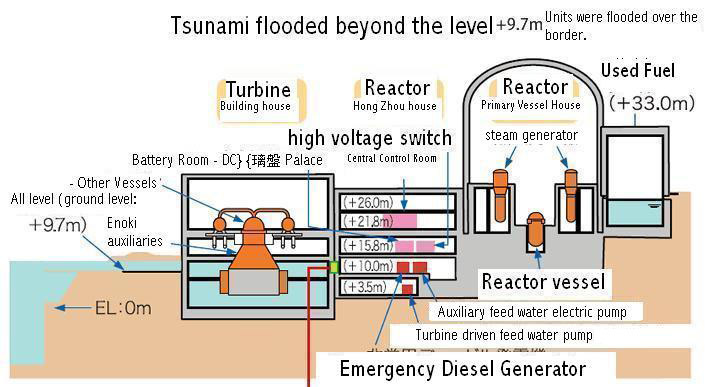 The physical siting of the plant puts it at high risk for considerable tsunami damage to important equipment. This issue along with the challenging terrain could make delivering equipment and workers impossible. 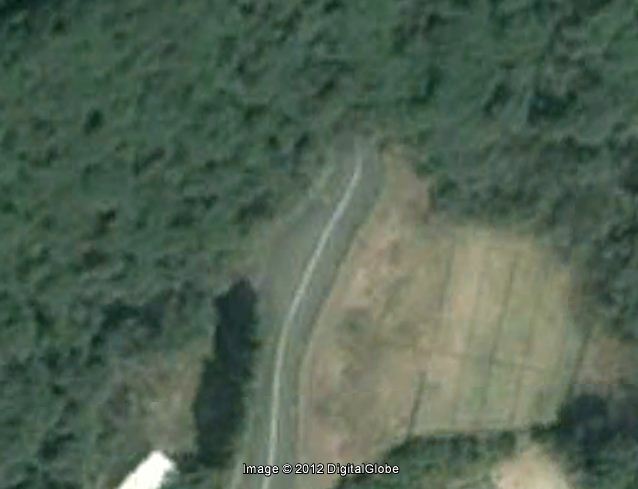 The risk of landslide is high, the one access road is at risk for landslide, tunnel collapse and tsunami damage and a very long expanse of the road sits at the shore line. It is also unclear where portable equipment would be situated at a higher location and if that area is at risk for landslide, loss of access or collapse. KEPCO’s solution was to contact a private helicopter company to possibly use their services in the event of a disaster. Even the military was reluctant to send in helicopters to Daiichi, the odds of a private company risking both their equipment and people is highly unlikely. Oi also does not possess a helicopter pad and the plant site lacks significant open space. The limited wider areas at the plant sit in the lowest area and would likely be full of tsunami debris. The ability to actually land a helicopter to offload people or have an effective drop zone for equipment is doubtful. KEPCO also looked at sea delivery of equipment. There are limited landing areas due to the terrain. Tsunami damage could further inhibit bringing equipment and people in by sea. So much of KEPCO’s fall back plan is hypothetical, depending on a variety of private companies that may not be willing or in operation after a major disaster. Oi is far from safe. Nothing the government or KEPCO has done to date seriously looks at the risks at the plant. Multiple factors contributed to the Fukushima Daiichi accident and would be involved in most accident scenarios. What we have found at Oi should cause the Japanese government to shut down the site permanently, not rush the reactors online as a favor to the power companies.